The Wizard of Odds: Will Notre Dame Turn Its Back on Clausen? Will Notre Dame Turn Its Back on Clausen? Jimmy Clausen, the most celebrated Notre Dame recruit since Ron Powlus, has been cited for transporting alcohol as a minor in connection with an incident a South Bend liquor store. Equally newsworthy is that the incident happened on June 23 and we are just finding out about it now. Clausen's eight months at Notre Dame have been shrouded in secrecy. As we've stated before, the freshman quarterback (he's the one on the right; we stole this image from our friends at M Zone) is likely to redshirt this season after having surgery on his right (throwing) elbow June 5 by famed orthopedic surgeon James Andrews. And Notre Dame's starting quarterback will be Evan Sharpley. In fact, the only time backup Demetrius Jones will be in the game is if a trick play has been called (opposing coaches, are you taking note?). Even some of the writers in South Bend are getting fed up with the Clausen situation. 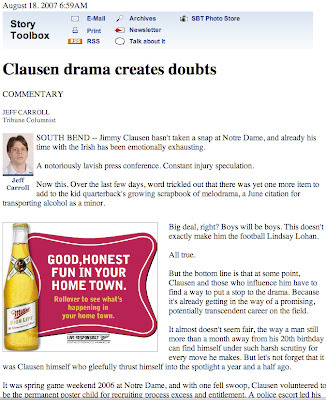 And while we are at it, what's up with a Miller Lite ad on South Bend Tribune columnist Jeff Carroll's online story about Clausen's underage transporting of alcohol? We had to perform a screen grab on this one. 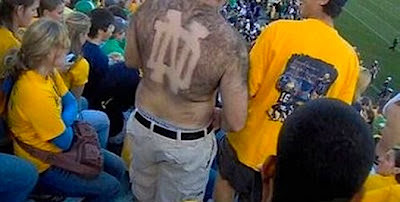 You are letting your west coast pro-USC/anti-ND bias get the best of you again. 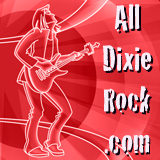 Clausen was sitting in the car as a 23-year old went in to buy beer. Who cares? Lay off the frosh and give him a chance to do his thing on the field. i sure did enjoy the ron powlus flop back in the day.